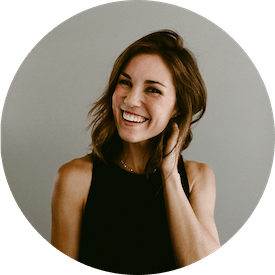 Before starting this blog, I promised my husband I wouldn’t air out his dirty laundry online. That was, of course, so long as he managed to put in in the hamper where it belonged. 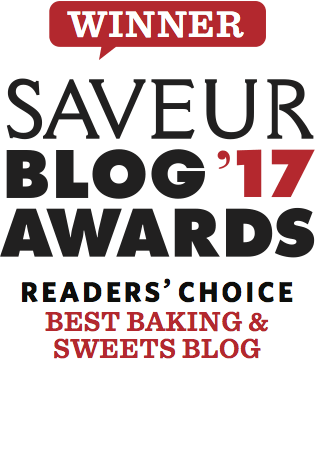 Jokes aside, both Brett and I have learned a lot through this blogging venture and he’s been really supportive by listening to ideas, stories, ingredient lists and technical woes. While I’m certainly able to go to him about the vast majority of my blog-related needs, the disparities between mine and Brett’s food preferences have become more and more apparent since the recipe testing began months ago. 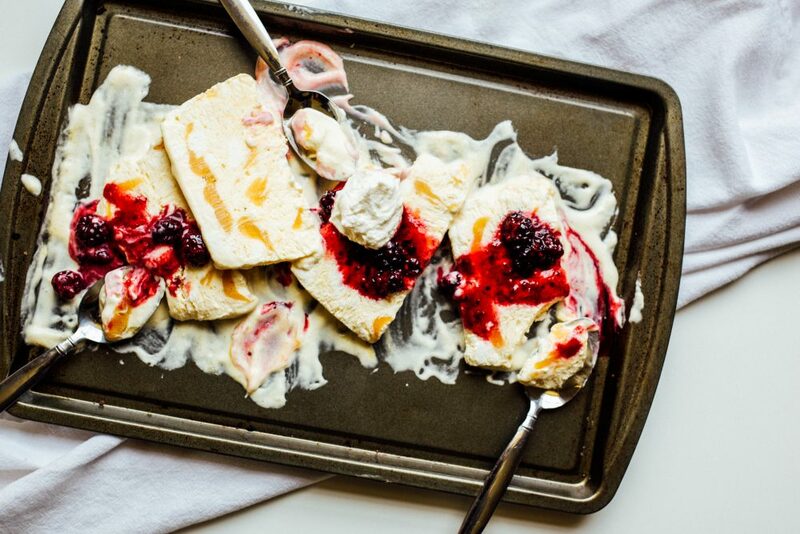 Exhibit A: Peach semifreddo with blackberry mint compote. If you’re thinking to yourself right now, “what is semifreddo?”, then you and Brett are tracking on the same page. Upon first hearing of semifreddo and spotting it in the freezer, Brett made his patented stink face and asked me if I had any cookies instead. 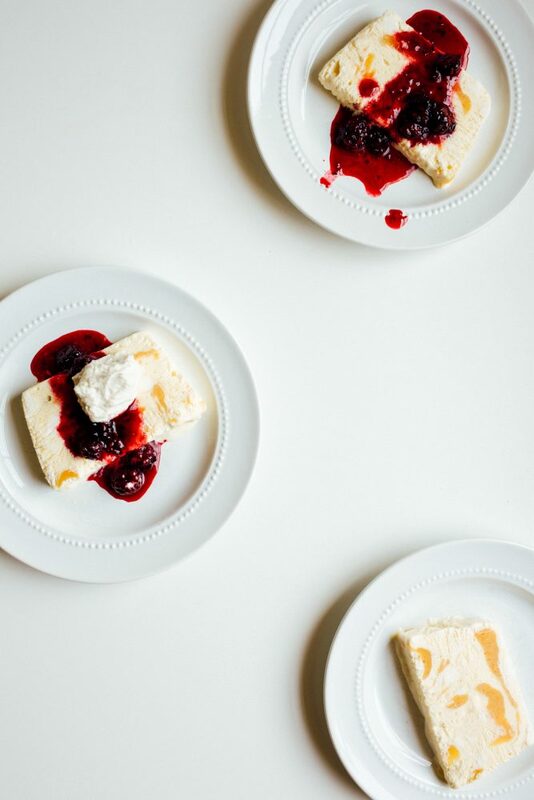 Truth be told, it’s not much to look at while it’s resting in the freezer, but sliced on a plate with a warm smattering of compote, this semifreddo has effortless good looks to boot. Semifreddo means “semi-frozen” and is a fluffy, mousse-like dessert made up of whipped cream, eggs, and sugar. The air incorporated during the whipping process causes this little sweet treat to freeze up light and airy, similar to the consistency of frozen whipped topping, making it 100% mouth-meltable and refreshing. I first tried semifreddo only recently at Bottega, one of my favorite restaurants in Birmingham, and proceeded to have dreams about roasted strawberries, toasted pistachios, and this newfound love of mine. Even more recently, I purchased the fruit-heavy cookbook by food blogger goddess Yossy Arefi called “Sweeter off the Vine: Fruit Desserts for Every Season.” Her take on semifreddo includes roasted rhubarb and it is an absolutely stunning addition to the book. In a cookbook filled with numerous promising recipes, the rhubarb semifreddo called my name and I knew I had to give it a try. 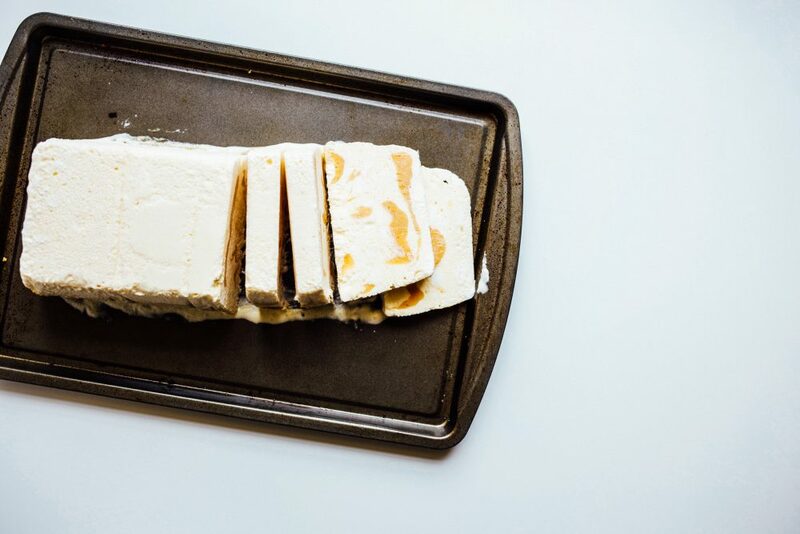 We’ve already established that ice cream has a major place in my heart (Exhibit B: confetti ice cream cake, mocha brownie fudge ice cream, and apple crisp ice cream ), but semifreddo is really quite different. 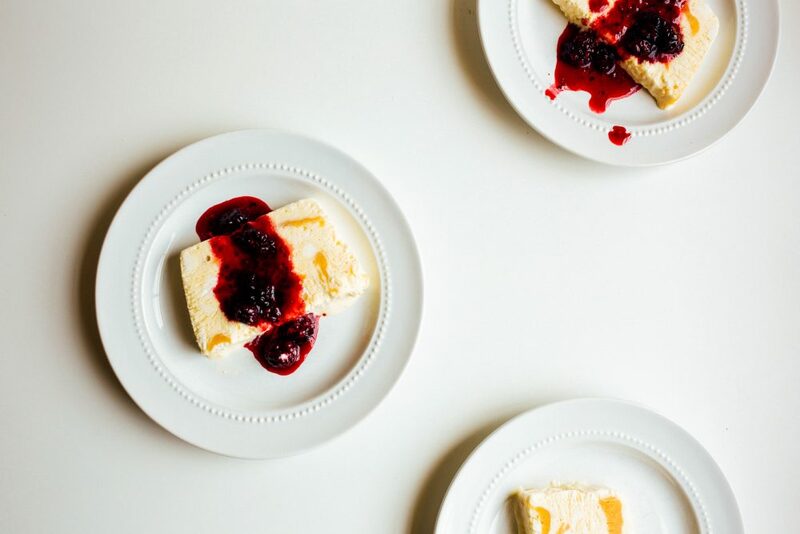 I love this recipe because it feels like a more polished dessert option than ice cream and because both the peach semifreddo and the compote can be made up to a week in advance, it’s a terrific make-ahead option for a crowd. With sweltering summer months just around the corner, I’m happy to have this recipe in my arsenal as a potential late night treat for Brett and I to snack on. If you’re not a fan of peaches, feel free to roast up a different fruit like strawberries, plums, or raspberries and swirl that in instead. The blackberry compote is an entirely optional addition to this recipe, however, I certainly recommend it. The contrast of the tart berries against the sweet and creamy peach semifreddo is really delightful. I also chose to top my dessert with a dollop of whipped cream, mainly because I have a hard time not believing everything is better with a little cloud of cream and sugar on top. Give this recipe a try and be sure to check out Yossy’s book here. The recipes and images are gorgeous and it’s definitely a book you’ll want on your shelf this year. Happy Wednesday! Peach Semifreddo is a fluffy, mousse-like dessert made up of whipped cream, eggs, and sugar, and it is 100% mouth-meltable and refreshing. Line a bread pan (9″x5″x3″) with plastic wrap or parchment paper, allowing an inch overhang on every side. Place the peaches on a sheet pan with 1/4 cup of the sugar and salt. Toss to combine. Roast in the oven for 15 minutes or until the peaches have begun to release their juices and are tender. Allow to cool slightly, then puree the peaches and juices in a blender until smooth. Cool in the fridge while you continue to work. In a double boiler, or in a pot with a glass bowl fitted on top (but not touching the water), whisk together the eggs and 1/4 cup of sugar. Continue to whisk, cooking gently over the simmering water until sugar is dissolved and the egg mixture registers 160 degrees on an instant read thermometer. This took me about 6 minutes. Pour the eggs into the bowl of a stand mixture and, using the whisk attachment, beat until the mixture is pale, fluffy, and nearly tripled in size. Meanwhile, in a separate bowl, beat the cream, final 1/4 cup of sugar, and vanilla until soft peaks form. Gently stir 1/2 cup of the peach puree into the eggs. Fold 1/2 of the whipped cream into the eggs. Once combined, fold the remaining whipped cream into the eggs. Spread about 1-1/4 cup of the mixture into the bottom of the prepared pan and then drizzle with 1/3 of the remaining peach puree. Repeat this process three more times, ending by smoothing out the final quarter of cream and egg mixture. Cover with plastic wrap and place in the freezer for 6 hours or overnight. When ready to serve, remove from pan by pulling up on sides of the parchment paper and flip out onto a plate or serving platter. Slice as you would a loaf of bread and serve slices with warm blackberry compote and whipped cream, if desired. Combine the blackberries, water, sugar, lemon, and mint in a small saucepan over medium heat. Cook for 10-15 minutes or until thick and bubbly. Remove the mint and stir in the vanilla. Allow to cool slightly before topping the semifreddo. Serve with whipped cream, if desired! The moment I saw “peach” in the title I could almost taste a fresh Ontario peach…oh man this has me craving summer! I’ve never made, or eaten semifredo, but this definitely seems like a dessert that I can get on board wit. 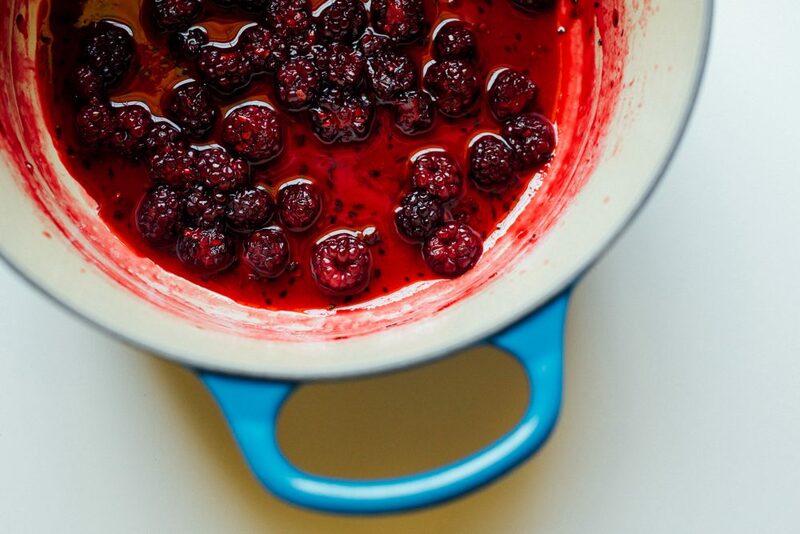 And that blackberry mint compote might just have to made this evening with the wilty mint thats been kicking around. Stunning Kate!